Swine flu isn’t here yet. As I write this we have no confirmed cases of Swine Flu in Cancun. But everyone is sure acting like it’s already here. I won’t bore you with details since my friend CancunCanuck has already laid it all out. Suffice to say that Mexican authorities are working very hard to stop the spread of this flu. I’m getting emails every day from tourists wondering if they should cancel upcoming vacations to Cancun or the Riviera Maya. I’m telling everyone to wait as long as they can to make those decisions. Something which has become clear to me in the last week is that Mexico has a significant lag time between finding a flu case “suspicious” and getting actual confirmation that a case is or is not Swine Flu. The reason for this is that there is not a lab in all of Mexico which can properly identify Swine Flu. So all samples have to be sent out of the country for identification and that takes time. I don’t know how fast Swine Flu cases in the U.S. or Canada are confirmed, but I’ll bet it’s faster than here in Mexico. And I’m worried that this difference in identification time is skewing the data. Data which is being used by all sorts of people to make all sorts of decisions. The fatality rate of the Swine Flu probably can’t be extrapolated until more cases are confirmed. And it’s likely that many cases in Mexico are simply not going to be reported at all, because they were so mild as to not warrant a hospital visit. Many are suspecting that when the data is fully collected this flu may not be more dangerous (in its present mutation) than a “regular” flu. But time and data will tell us this. In the mean time I continue to tell tourists the truth, which is that it’s not here yet. And I continue to encourage them to wait as long as possible to make their decisions to change or cancel their trips to Cancun. There will only be more data later. I complained recently that I have not been running enough lately. Well it’s not for lack of trying. The other day my hubby and I went to the Parque Kabah to run. We got about halfway through our first lap when the sky started to get really dark. A storm was coming. As we neared the entrance to the park, completing our first lap, the sky opened up. But instead of taking shelter under the thatched palapa roof at the entrance we kept running (don’t ask me why). Within moments the path was flooded with 3 inches of water and my running shoes were soaked! One thing I’ve learned over my 18+ years of running is that running shoes are never the same after they get wet. So normally I will run in any weather, but will run back to my car FAST if it starts to rain. This time I screwed up and soaked my shoes. We got home and waited for the rain to stop so we could put our shoes in the sun to dry. But it rained for most of the rest of the day. The next day it was sunny, so I put our shoes out in the sun. And then suddenly, crash, flood, it was pouring! We had the single strongest downpour I’ve ever seen and it started all in one second. I raced to shut the windows in the house. And I didn’t collect the shoes from the rain until they were well-soaked through all over again. The next day the weather cleared and I decided I wanted to run. But my shoes were still wet. So I dug out a pair of old running shoes from the closet. They were a pair of Sauconys that I had stopped running in about 3 years ago, but for some reason they had never been thrown out or donated, they were just sitting in the closet. I donned these old cruddy worn-out shoes and figured my run would be less than ideal because of them, but at least it would be a run. I got in the car and drove to the park. But as I was walking into the park I had the feeling that something was stuck to the bottom of my shoe. Then I felt the same on the other shoe. Then the sensation changed and it felt like the heels of my shoes were loose and were flopping. I looked down. All of the foam that made up the heel cup of my shoes was disintegrating! With each step I was leaving a trail of foam bits. The more steps I took the more my shoes fell apart! It took me a few minutes to accept that I wasn’t going to run that day. I made myself do my normal stretching routine. But after 10 minutes of stretches I left the park and walked back to my car, trailing foam bits the whole way. When I got to the car I realized that the floor area of the driver’s side was covered in foam. When I got home I saw foam in the driveway. And when I got inside the house there were foam bits everywhere (and I had just vacuumed too). My husband professed that he’d seen foam all over the house and had been wondering what the heck it was. Since moving to the tropics we’ve noticed that lots of foam and rubber things fall apart, especially if you don’t use them. We’ve thrown out a number of nice pairs of shoes and boots that we had expected to last for many more years. Tropical heat somehow wrecks rubber and foam. 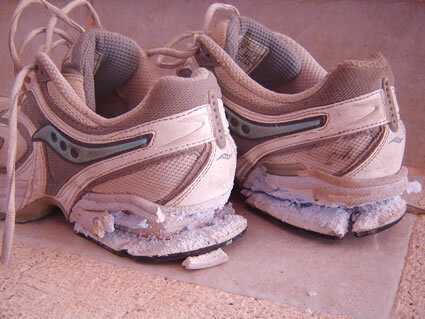 My regular running shoes have since dried out. They don’t feel as comfortable as they did pre-rain, but at least they are intact. I’ve got a good friend who is bringing me new running shoes from the U.S. in a couple of weeks, so I’m looking forward to that (can’t buy my brand here)! I’m not very good at being sick. I’m a good enough patient, in that I take my meds as directed and mostly do what the doc says. But the mental side of things is rough for me. Inactivity makes me depressed, it always has. If I go more than 3 days without exercise I start feeling uncomfortable in my skin. And when I’m not moving around I’m more prone to headaches and body aches. So sometimes the bed rest I need when I’m sick makes certain symptoms worse. Being sick, especially when it’s a lung thing, means I have to walk that fine line between doing too much and not doing enough. If I lay around “healing” then things that didn’t hurt before start to. If I force myself to move around I wear myself out and don’t heal. As I get older the ratio between how much to move and how much to NOT move is changing. So the answer to this mystery of how much to rest and how much to not rest changes over time. Well, I’m just not smart enough to figure it out…too many variables in this equation for my pea-brain. The good news, I guess, is that I’m well enough to worry about this. Four days ago I was so sick that going down the stairs to make a cup of tea would leave me dizzy and weak for hours. Now I’m pondering whether to go walk the dog. So I guess that whatever this mysterious ratio of activity and inactivity is I must be mostly getting it right, since I’m mostly feeling better. I’m getting better but it’s slow and arduous; two steps forward and one step back. The doc wants me to do another round of antibiotics and he’s concerned with how much fluid is still in my lungs. I’m a long way from being back to normal but at least the fever is gone so I can think again. Thanks to all of my pals who’ve commented and called and sent emails. When you are flat on your back feeling horrible it’s very nice to know that you have friends out there. A week ago I had what I thought was a pollen allergy attack. It came suddenly and the symptoms were sneezing, itchy eyes and a scratchy throat. The next day I had a low fever but didn’t feel too bad. But that night the fever rose to over 101.7Â°F (38.7Â°C). For the next couple of days the fever rose and fell depending on how much Advil I took, but it never broke. I also developed a cough which got worse and worse. Finally I agreed to let my husband drag me to the doctor. Given that his job provides both of us with health insurance I agreed to go to the emergency room at the ISSSTE clinic which is covered by our policy. We always joke that the service at the ISSSTE is so bad that you only want to go there in an emergency. Well we got there and the Urgencias sign was lit up, but the door was locked. We could see that the building was occupied so we went looking for another door. We found a security guard who told us that yes there was a doctor in the building but that she couldn’t see me. My husband can be very insistent and basically made the guard take us to see the doctor. As the guard led us through the back alley of the clinic we passed several starving kittens. I wanted to scoop them up and get back in the car and go home. I did not want to deal with a clinic that didn’t want to help me. Once we got inside the ISSSTE clinic my husband found the doctor and asked her to see me. He told her I had been running a high fever for 4 days. Her response was to BLAME HIM for not bringing me sooner (he’d been begging me to go to the doctor for several days). She also said she could not even examine me because she would get in big trouble. She gave a long convoluted explanation of all the bureaucratic red tape that was barring her from even looking at me. The next day, yesterday, I woke up and the cough was stronger. And it had moved into my lungs. I could feel a heaviness in my chest. This time my husband took me to a private doctor who was recommended to us. The doc asked all the right questions, checked me for dehydration, checked my organs and listened to my chest. And then he listened to my chest two more times. His diagnosis is a bacterial lung infection. If you Google bacterial lung infection you find lots of hits for pneumonia and some for bronchitis. I’ve already had pneumonia three times in my life. Each time I came down with it just after a drastic change in the weather (the transition of winter to spring). I’ve had bronchitis twice, once it started after a big change in the weather and the other time it started after getting a lungful of campfire smoke. Two weeks ago our rainy season began here. Prior to that it was dry and hot, but two weeks ago we started getting big downpours. And now here I am with a lung illness. The doc put me on an antibiotic and an expectorant. It would have been good if I had realized sooner that this was not an allergy, but the first couple of days of the fever I was convinced that I was just very allergic to something that that rains had given bloom to. I guess with my lung history I shouldn’t have screwed around, but I didn’t realize I was sick until I was very sick. I may not post for a while, it will depend on how well these antibiotics work. Entries (RSS) and Comments (RSS). 32 queries. 0.561 seconds.